Each one unique and with outstanding design features to suit any size and any budget. We’ll give you the latest design advice and show you how you can turn your kitchen and bathroom dreams into reality. Because we’re completely mobile, we come to you at a time that’s convenient for you. We appreciate that you’re busy so we can schedule our meeting around your commitments and family life. Ideally we’d like to meet at your home (or the site of your new project) so we can see the space we’d need to work with and take some measurements so our design fits perfectly. Our designer will discuss your ideas and everything that you’d like included, and he’ll give you the benefit of his design experience and training. Taking your budget into consideration, he’ll let you know what’s feasible and he’ll give you advice on alternative options if your budget won’t quite stretch to include everything you want. 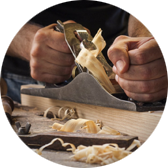 During our meeting, you’ll see a range of our finest benchtops, handles, drawer systems and cabinets so you can see some of the most popular options available to you. 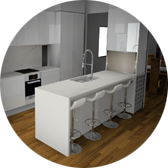 Following our initial consultation, we’ll then prepare a quote and 3D model of your new kitchen or bathroom. 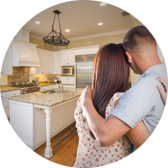 From inception to completion, once you give us the go ahead, we manage the whole process until your new kitchen or bathroom is installed and fully functional. The best kitchens and bathrooms start with a great design and that’s why we meet with you at the location of your project. We get to know you, your requirements and ideas, the functionality you’re looking for and the space that’s available. We talk about your budget and we show you the products range and material options that suit it. We’ll also discuss colour palettes and the look you want to achieve for your new project. Following our initial meeting, we provide you with a detailed quote. This includes details of the products, materials, selections and finishes. We’ll also provide you with high quality 3D images of your new kitchen, including the finishes and colours you’ve chosen. If you want to make any changes to the design, now’s the time to do it. The 3D concepts really bring your kitchen or bathroom to life so if you want to change any colours or materials we’ll make any adjustments you want. 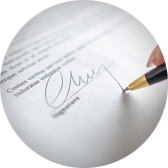 Once you’re happy with our quote and everything that’s included, the contract is prepared and signed. The contract details exactly what we will be delivering and how it will be paid for. At this stage we also confirm timings based on your availability and access, and we’ll give you a project schedule that outlines when everything is scheduled to happen and when your project will be completed. 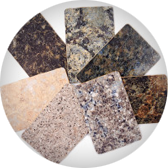 We place orders with all of the product and material suppliers and we schedule all of the trades. You’ll have a project manager who will be your day to day contact and from the moment our team begins work, he’ll keep you updated with progress and confirm that we’re running to schedule. When the project is completed we’ll ask you to check everything to ensure you’re happy with the result. We take the quality of our workmanship very seriously but if you do find anything that you’re not completely happy with, we’ll fix it.